What happens on The Listening Party 021 stays on The Listening Party. Well, not exactly, but Clifford Smith, aka Mr Vegas, is in the spotlight today. Vegas has a new album on the road called Sweet Jamiaca which he hopes will put his career on firmer footing than he says it has been despite international hits like Heads High, which peaked at #69 on the US R&B chart and earned him a MOBO award in the UK. Subsequent hits like I am Blessed, Take Weh Yuhself, Hot Wuk, and most recently, Bruk It Down, would suggest Vegas has a lot to be happy about. But he tested retirement in 2008 and in a recent radio interview just a few weeks ago to promote the new double disc album which incldues one reggae disc and one dancehall disc, Vegas said, "I have not enjoyed my career none at all because the Dancehall side becomes a hustle and it becomes just a daily job that I have to do." The music on The Listening Party today is taken from the reggae disc of Sweet Jamaica. 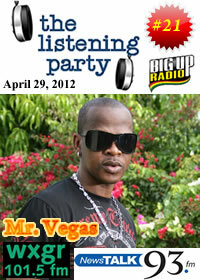 As you will hear, reggae, according to Mr Vegas, is where he wants to focus his career. So the soundtrack today is all reggae all the time with Mr Vegas providing new insight into his goals, his likes and his dislikes about his experiences in Jamaica and abroad. And if you know Vegas, you know he doesnt hold back.